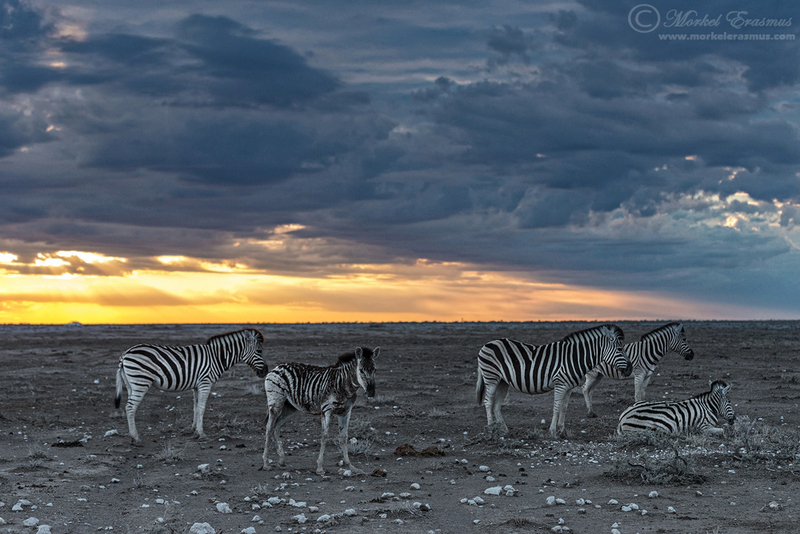 It's early on a summer morning in Namibia's +Etosha National Park. The first summer rains have just started to fall - so everything looks and smells fresh. There's still a lot of cloud cover overhead from last night's deluge...but there's a gap for the sun to rise into on the Eastern horizon. As I drive out of the gate of the Okaukuejo camp with my wife and kids in the back of the SUV (kids still dozing), I head East towards the nearest waterhole, which is called Nebrownii. As the sun starts peeping over the horizon and through the break in the clouds, I find my first willing subjects - a small group of Plains Zebra. Fiddle to grab the nearest camera. Lens too long (500mm). Switch to the other camera - this one has a better focal length (70-200mm). Framing a rising sun and plenty of sky with wildlife at the bottom makes for a tricky exposure. This is where using your exposure lock function helps, as well as back-button focus to be able to focus and reframe. Finally satisfied with my exposure on the D800 and 70-200mm combo, I contemplate swopping the 500mm on the D3s for a shorter lens, but realise the sun will rise behind the clouds in a few moments. So I grab my instamatic wide angle that is always with me (that would be the Apple iPhone 5, folks), switch on the HDR function, and snap a few images that way. Sure, the iPhone version doesn't have the same high resolution quality, and it came out a bit over-the-top when it comes to the HDR effect, but it does make it look quite surreal. The perspective is definitely better for me at this wider focal length. Perhaps I should have switched lenses right away when I got there...but I will have to take that lesson into my next safari. 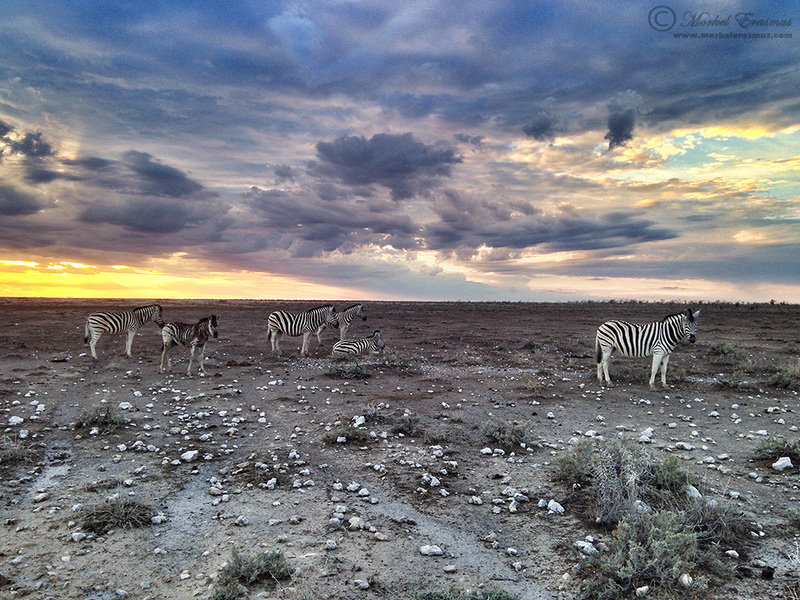 Clouds are compelling w/ iPhone with the subject (zebras) almost incidental. I prefer DSLR, but would lighten it up a bit. By the way, how do you like the D800? I just bought one and seem to require a tripod for almost everything. You are correct, I might play with the DSLR shot some more. I love my D800 but it is a very fickle sensor and I normally shoot at higher shutter speeds than I normally would for each focal length to get sharp images handheld. Cheers Wayne. I am still kicking myself for not rolling with the 24-70mm on the D800 at this sighting. The light was fleeting, though...and I made choices on the fly. Nebrownii is one of my favourite places! And I agree about the best camera being the one you have with you - I've got some great memory shots from my phone that I wouldn't have at all otherwise. Right on Roxanne. Thanks for stopping by! Morkel was that taken with the iphone 5s? Hi Andre. I hope you are well. It was with the iPhone 5. I'm almost hesitant to admit it Morkel but I like the iPhone version more because of the beautiful sky and lighter stones! This makes me wonder why I leave my (reasonably potent) compactflash at home during safari's as it can be quite useful for wide angles and macro's! Thanks for popping in, Tobie! I agree, I like the iPhone version somewhat more and wish I had slapped on the 24-70mm on my other camera body for this scene. Alas, the phone image will have to suffice. I do think it might be worth it investing in a small camera that can shoot basic RAW files at relative wide angles for quick snaps and general travel use. I love the IPhone version you captured, great shot! I fully agree on your comment about a nifty pocket camera that could shoot RAW!